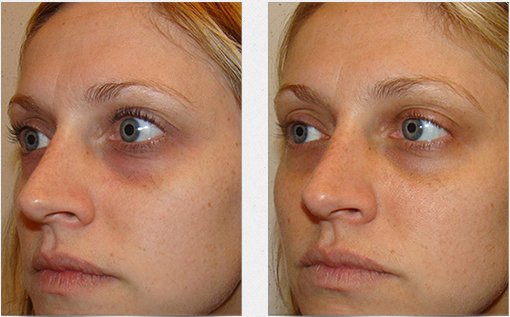 Carboxytherapy can dramatically improve the appearance of dark under-eye circles. Although sometimes caused by darkened pigment, or a hollow depression below the lower eyelids [tear trough deformity], the majority of dark under-eye circles are caused by poor circulation beneath the lower eyelids [vascular pooling]. During the first study in the English literature using carboxytherapy for rejuvenating the under- eye region. they found that by injecting a small amount of carbon dioxide gas just beneath the skin of the lower eyelid, circulation was increased and dark under-eye circles were markedly improved. The treatment takes only five minutes, and is virtually painless and risk-free. A series of 2-6 treatments spaced one week apart is all that is required to achieve a great result. From stress to those who are overworked, dark circles around the eyes is something that plagues a lot of people. There are lots of ways adults and children can develop these dark circles under their eyes. Yes, some people have dark circles under their eyes because of lack of sleep or too much alcohol. But those aren’t the only reasons. Let’s talk about other possible reasons why you have dark circles under your eyes and what you can do about it. First, let’s understand how dark circles appear. We have tiny blood vessels, which are like a web under the skin. But these capillaries are so fine that the red blood cells queue up to pass through; in the process some of them leak in the surrounding area. Enzymes are produced during the cleaning up session. The breaking down of these red blood cells leaves them black and blue. The reason why this is so visible is that the skin around the eyes is the thinnest. Aging – The skin under the eyes is thin and delicate to begin with. As we grow older, skin around the eyes becomes thinner making blood vessels more prominent, causing dark circles. Genetics – Hereditary and genetics can also play a big role in the development and dominance of dark circles around the eyes. Nutritional deficiency – Dark circle around the eyes can be due to poor nutrition. A healthy and nutritious diet filled with vitamins like A, C, K, E and nutrients can help to get rid of dark circles. Sleep deprivation and tiredness – A lack of sleep or excessive tiredness results in pale skin, making blood under the skin become more visible and appear more blue or darker. Smoking and drinking – Late night parties, smoking and drinking can play havoc with your skin and result in dark eye circles. Dark eye circles could be a sign of loss of water from the body (dehydration) due to excessive drinking and intake of caffeinated drinks. Sun exposure – Increased exposure to the sun can draw pigmentation of the skin’s surface and create dark circles. Long sun exposure produces more melanin around eyes than usual, giving them a darker color. Hormonal changes – In women, the skin undergoes lots of changes during the phase of pregnancy and menstruation, causing darkening under the eyes. Allergies – Any condition that causes the eyes to itch may contribute to darker circles due to rubbing or scratching the skin around them. Apart from that, some food allergies can also cause the area under the eyes to appear darker. In fact, dark circles in children often indicate allergy problems. Research also suggests that dark circles are linked to anemia, and liver diseases. Dark circles and anemia – Iron deficiency is one of the most common causes of inexplicable dark circles in many cases, which can be treated by making simple changes in your diet. Low iron levels is the most common form of anemia, and results in poor oxygenation in body tissues due to low supply of oxygenated blood. Thus, always take a balanced diet rich in green leafy vegetable, dairy products and all types of fruits to keep your body healthy. Dark circles and dehydration – Dehydration is one of the most common reasons for dark circles under the eyes. The reason is the close proximity to the skin underneath the eye in relation to the underlying bone. When the body does not have a proper amount of water, the symptoms are often evident in this specific area. Thus it is advisable to have at least 8-10 glasses of water and include fresh fruit daily. It is also advisable to restrict the intake of caffeinated drinks such as tea, coffee, alcohol and other caffeinated drinks as it aggravates dehydration. Dark circles and liver disease – Dark circles also indicate liver dysfunction due to various liver ailments. An example of such a liver ailment is hepatitis.